Sometimes I just don’t want a burger. I had some errands to run this afternoon including getting an oil change in my company vehicle. I usually go to the quick change place that used to be a Valvoline on Drake right next to the Drake Party Center. After taking care of that, I decided to go around the corner and bring home lunch. 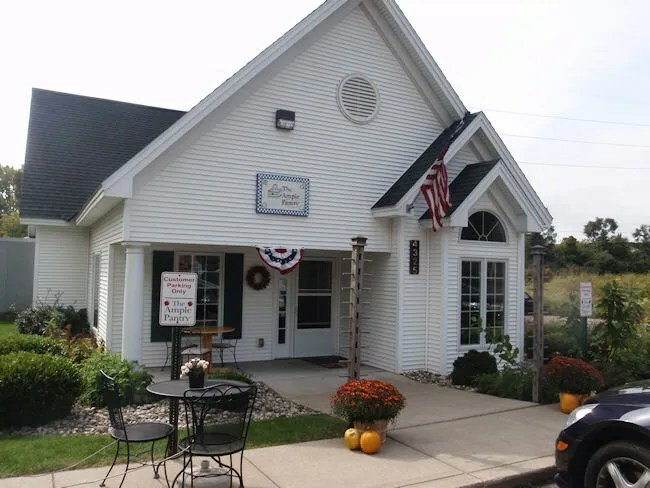 The Ample Pantry is one of those places you could drive by a hundred times and not know it was even there. There’s a sign for the place out on Michigan Avenue just to the east of where KL turns in to Michigan, but the building is way back off the road. It’s a cute little building that looks like a little house with a large parking lot. Inside, it has a really homey feeling. There are only a handful of tables in two small dining rooms. When I walked in, I was met at the counter by an employee who asked if I was there for lunch. 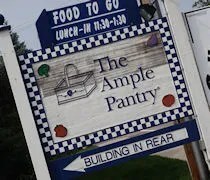 In addition to the dine-in lunch, Ample Pantry has a large delivery/catering aspect to their business. They call it “Home Delivered Meals.” I was just in the market for a couple of boxed lunches and I asked if that was an option. The first lady I talked to didn’t seem to know the answer to that, but there was another woman right around the corner who heard the exchange and came out to help us. She grabbed a menu for the “Home Delivered Meals” and told me I could basically pick anything that was not part of a buffet service. That worked out really well because there are three options for boxed lunches. I chose the one they actually call “Boxed Lunch” which includes a sandwich, a salad, a fruit, a dessert, and a drink. I decided to get meals for J and her mom as well as myself so I ordered three box lunches. One with a turkey sandwich. One with a ham sandwich. One with a Roast Beef sandwich. 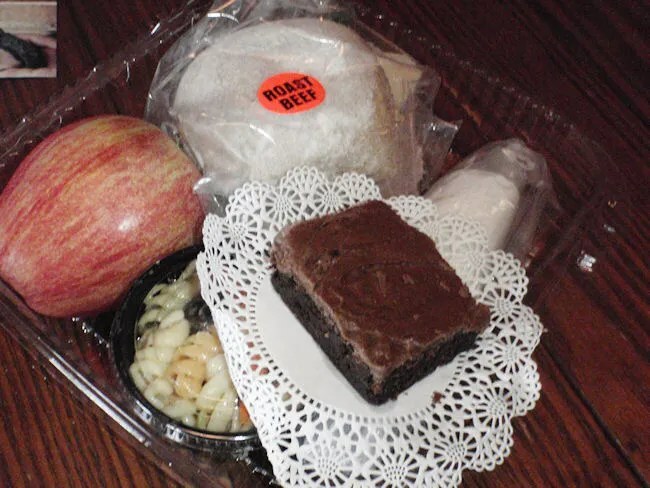 I got pasta salads and brownies in all three and the fruit by default was an apple. I passed on the drinks which would have been either lemonade or iced tea. That also knocked $.50 off the price of each meal. The total was a little over $25 for the three boxed lunches and almost as soon as I took a seat in the quaint dining room to wait, I was being handed a back with my three meals. When I got home, J’s mom was actually loading up to leave. I asked if she wanted a sandwich for the road, but she declined. That just means I’ll have a boxed lunch for my lunch tomorrow. J was a little surprised that I had brought home lunch and she wanted to run a few errands before eating, so I put the ham sandwich and turkey sandwich in the fridge and sat down to eat the Roast Beef sandwich while I fed L some Baby Mum-Mum’s. There was a lot I liked about this sandwich so I don’t even know where to start. The bread was incredible. The soft, fresh bread had to have been home made. I could have just eaten a whole loaf of it and called it a meal. It was so good. 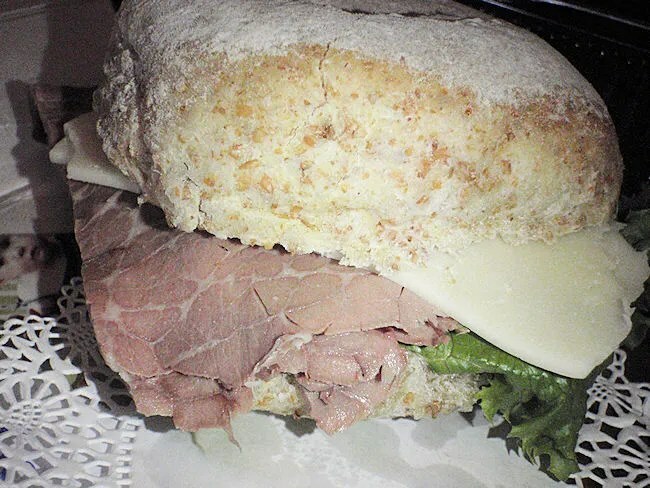 Between those two slices of bread was a thick cut roast beef, cheese, and lettuce. Mayo was served on the side in a packet which made me very happy. I forgot to ask when ordering and was afraid it was going to be already on the sandwich. As far as cold meat sandwiches go, this is by far, one of the best I’ve ever had. As for the sides, the pasta salad came with a small cut of fresh veggies and was delicious. The brownie that I chose for dessert was soft and gooey and came with a chocolate frosting on top.